I just wrapped my two months at Gray Knob cabin and I’m already looking forward to returning for another stint in the White Mountains (if the RMC will have me). I hope to experience each of the seasons in their entirety although I suspect autumn will always reign supreme in my view. I almost didn’t come down before this last stint. When I woke on the morning of my day off, thick clouds surrounded the cabin and I thought nothing of it as I recorded the weather and suited up to head down. Just as I started on the trail a gap formed in the clouds revealing a glowing golden morning sun and blue skies scrubbed by a just-passed storm. Pink and purple halo hues lined the edges of the clouds and reflected in the soft fresh snow. I paused and debated returning to the cabin to get my camera but continued on, expecting it was just a sucker hole and the clouds would reclaim the view by the time I climbed back up. But it persisted. I stopped again but thought if I turned around I wouldn’t get out that day. Mike and Bill were scheduled to fill in and I opted to not rattle the plan. That was a mistake. It turned out to be one of the most beautiful days on the mountain. Without my camera each amazing glow, dappling shadows, intrusive illumination and unique variation of sunlight on cloud and mountain pained me. Of course. Then I decided I could still experience this phenomenal place in a special way. Though momentarily saddened I couldn’t share it in photos I committed to do my best in words. I didn’t really need to come down at all. Over the weeks I had stocked up with enough food, save running low on butter, to last me this final nine-day stint. And I had friends coming up for a visit who already had a shopping list. The return trip was not quite so glorious. The storm returned in full force with driving rain in the valley where I started and sub-freezing temperatures up at the cabin. I would first get soaked then freeze solid as I gained altitude. Great. The storm continued for the next few days. Sitting in my rocking chair looking out the windows, I watched swirls of snow rush by in horizontal streaks then bolt straight up! Gray Knob is a stout cabin and it takes a good wind to make much noise inside but this was just such a wind. I snuggled deeper into my chair and book and went on an adventure through the jungles of Borneo. Halloween was approaching and I hauled up a pumpkin that I swiped from Al’s place. Sally was my only guest on the eve of Halloween. She’s applying to be a caretaker next summer and came up to check the place out. Overnight and during the day the temperature hovered right at freezing making any venture outside a wet and sloppy affair. Again, the world started melting around me and the statuesque trees of rime dripped their way back to green. On the 31st Sally had to hike back down but not before we carved “Winking Jack” to protect the cabin (and me!) that night from all the evil spirits. Afterwards we fried up and snacked on the harvested pumpkin seeds. Winking Jack must have done a really good job as not a single trick was threatened or treat requested at my door. On the first day of November it was time to get out again. The skies cleared and for the first time since stumbling around in the thick fog and Krumholz contemplating an overnight out in the storm, I ventured above the tree line. This time the sun was out, the winds were gentle and the temperatures had returned to below freezing putting a nice firm crust on the surface of the snow. Unfortunately the crust was not quite as thick as I would have liked and towards the end of the trip the steady sunlight softened it and I started punching through and post-holeing my way along – a very inefficient way to travel. In the morning though, the crust was still firm and it took a good kick to even get a modicum of a toehold for my boots. Because of the way snow gets compressed when you walk on it, I could see faint traces of my venture up this slope in that blowing snowstorm the previous week. I wondered if I’d be able to retrace my steps and see where I’d wandered off the trail, but to no avail. I continued up after I passed the cave where I had my cup of tea and easily popped over Adams 4, which was so formidable in that storm. Crossing the Adams snowfield to Thunderstorm Junction was an easy jaunt. 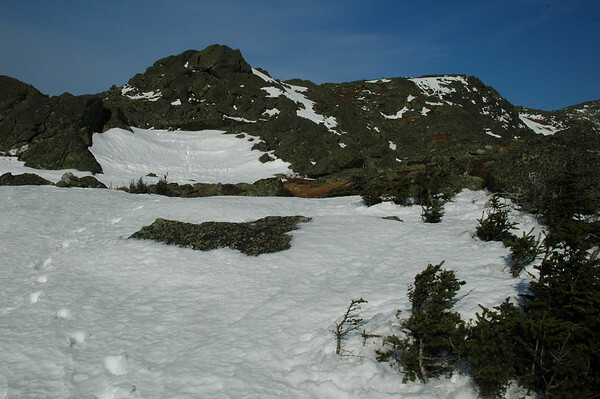 The technical aspect of rock hopping and balance was resolved by the leveling of the terrain by the snow. I continued up and made the summit of Adams in perfect conditions. Mt. Washington and the surrounding peaks were showing off their new white coats and I was drawn to follow Gulfside Trail down to Edmonds Col.
Once on the south side of Sam Adams peak the going started to get tricky. The south side gets the most sun and I started punching through the softening surface. At first my right leg was the only one punching through but things evened out – both legs would sink deep. I was relieved to make it to where the rock trail emerged and I could return to the simple rhythm of left-right-left-right. As I descended into Edmonds Col a sudden explosion of feathers startled me. A ruffled bard owl stood on the trail blocking my way and he didn’t seem too happy about being rousted from his cozy spot. His body heaved and his eyes locked on me like I was his next dinner as he pulled his outstretched wings slowly back along the side of his body. Once my heart rate slowed I started snapping photos. I would take a few shots then move for a better angle and light. Every time I shifted he would snap his beak and make a loud chomping sound. When I stopped moving he stopped chomping. Now we understood each other. I’m sure when I left he watched me until I was well out of sight and a bit beyond. I reached Edmonds Col deep in the shadow of Mt. Jefferson. Most of the snow had been blown clear by the high winds that funnel through here and the going was easy, except for the parts where ice had formed along the trail. But the intricate patterns captivated me: sharp shards, delicate lace, and the solid gray ice inches thick and unbreakable. Back in the sun I was on Randolph Path again and wallowing in snow, usually sinking right up to my crotch. Snowshoes would have been really nice. And let me take this opportunity to mention the exact pair I would have liked to have. A pair of Atlas 1222’s. Twenty-two inches long, aggressive traction, full suspension and ratchet bindings. Next time I will have those with me. Yes, I worked for Atlas so I’m biased, but yes, they are the best. I punched, waded, crawled, waddled, and swam my way through the warming snow down Randolph Path to the Perch. 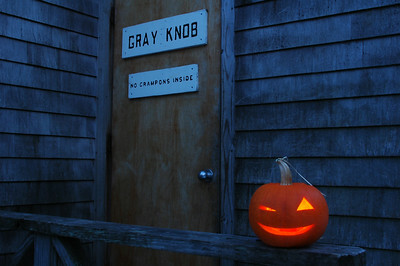 It was nearly 4pm when I arrived – six hours after I had left Gray Knob. Without the snow, it would have taken half the time. The Perch was empty as expected so I continued on to check the other camps finally arriving back home around 5pm very ready for dinner and some rest. The next day, Thursday, was sunny and beautiful again and I took it easy, strolling a little ways up Lowe’s Path and over to Crag Camp to get some photos. The clouds returned overnight bringing another fresh blanket of snow and a gray morning. It felt like living in a black and white photo. Then came a call on the radio. Jordan and Lizzie had arrived at Al’s after driving up from New York City and were wondering if I was coming down to meet them and guide them up. Get them on the trail and I’ll meet them part way, I replied. It was almost noon and I would need to start rounds in the next couple hours. I zinged down Hinks Trail, taking big plunging steps, lunging into a telemark ski stance for the stretches I could get some glide in my boots and using the skinny trees as poles and pivot points to whip around corners. I had a blast bombing down the mountain to meet my friends. I hoped to meet them at the Pentadoi (a five-trail junction), the point I consider to be half way up, but two-thirds of the way along on the map. I met the girls just below that and walked with them back up to the Pentadoi, across Cold Creek and sent them up Spur Trail to Hinks Trail – a direct shot up to Gray Knob. By now it was about 2pm and I started my rounds, heading over on Randolph Path to Log Cabin, up to The Perch, back to Gray Knob and over to Crag Camp. The girls were settling into Gray Knob by the time I returned and had a few choice words about the last push up along Hinks. We settled into the evening with a big pot of homemade chili, got caught up on each others lives and laid out some options on what to do with the endless opportunities that tomorrow would bring. Saturday morning we had a lazy start with chocolate chip pancakes and bacon. 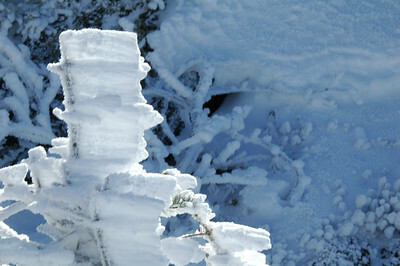 We then ventured under clear blue skies to Crag Camp and up to Knights Castle to heighten our overlook of King Ravine. The girls continued a bit further up Spur Trail while I shot back to Gray Knob to meet Al, Mike and Storm who formed the ad-hoc RMC maintenance crew. They cleared blow-downs along Lowe’s Path on their way up and then the four of us worked on fixing the wood stove that had some sort of clog in the flue. This made a pretty good mess of the cabin, but Joe, one of our guests followed us with a broom and did what he could to keep the place tidy. Of course after thinking we’ve fixed the wood stove, the only way to know for sure was to start a fire. The maximum temperature that day was only about 20°F and the sun was out… no need for a fire really, but we got photos of the Fire Grinch, Derek “Storm” Schott, posed next to the oddity of a midday fire. There was some trouble getting it going however, and Mike was caught on film using a blow-torch to get it going. Who are these guys!? The stove resolved, it was time again to go on rounds. The girls joined me for part of my last run. Along the white trail, my mind flipped back to the days before the snow, the warm days at the end of the summer where I would slow my pace to keep from getting sweaty, hopping from rock to rock; the autumn days when the few deciduous trees and shrubs were changing color, framed by their dominant evergreen neighbors; the early signs of winter with a light frost coating everything; then traces of snow filling the nooks and crannies and now the pillowy rolling texture of winter. When the temperature warmed the winter world would drip around me only to freeze again into a new winter coat: all four seasons in one. We descended from winter back into autumn on Sunday where the snow-covered ground slowly conceded – from dominate coverage to small patches of bare earth to mere traces of snow then none at all. Matt, one of the winter caretakers, was heading up as we reached the trail head. 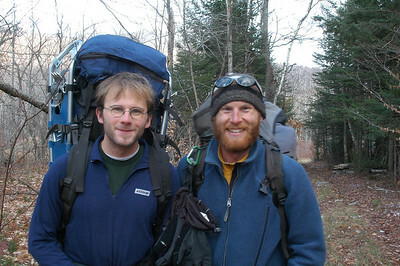 His pack was bulging, snowshoes were strapped on the side and the early signs of a beard were just starting to cover his face. Our exchange was brief but the ceremonial value of passing the torch was appreciated and he continued up the mountain to Gray Knob. That night Al had a party and I showed my photos of RMC land in a repeating slideshow for people to see at their leisure. 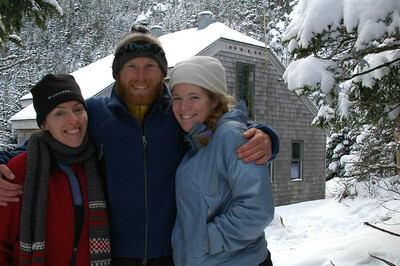 Jordan, Lizzie and I departed the next morning for New York City. What a contrast: to immerse myself among millions of people after spending so many days on my own secluded in the mountains. We left behind the snow and the solitude; but the memories I take and share. This entry is filed under: Earth, Hike, North America, Snow, Story. Pingback: Lizzie Loomis: Wedding Chef « Cameron and Jordan – What A Day!